In retail stores, sales of large (over 1ct) diamonds are down; jewellers are not replenishing their stock of rocks, but giving more space to small-diamond pieces. Why? The young generation are wary of the big ERs, because of the priority they place on experiences instead of objects, concerns about conflict diamonds, and (my opinion) wising up to the controlled pricing of the diamond industry. With behaviour changing among that cohort, jewellers are better serving another segment: the "midult", the woman past forty who can buy her own jewellery. Why, they ask rather plaintively, will she order a $1, 500 designer bag online, but not a pair of earrings? What does this mean for you? Many outstanding designers are creating interesting, informal and well-priced pieces using very small diamonds. Diamond is still my favourite of the gem minerals, for its versatility, durability and the frisson of a little sparkle. Like a macaron, even a small one can delight. 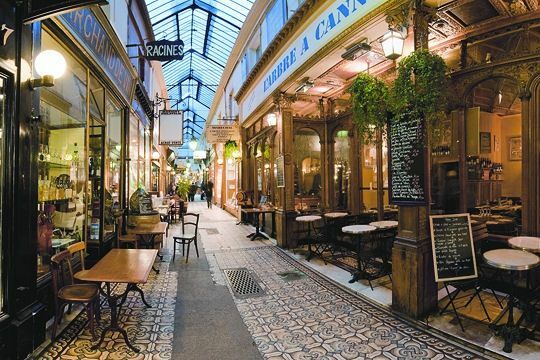 Today, the Passage's windows are dressed with such jewellery, priced under $1, 500. At this price point, the diamonds will be no larger than 1 to 2.5 mm, and sometimes set in silver. 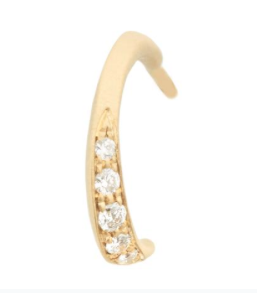 Irit Design diamond hoops; price, $950 at Beladora. Set in silver, these earrings have 2 ct total weight in diamonds, and they are not demure. If you'd like diamonds you can wear with jeans, this is the pair! 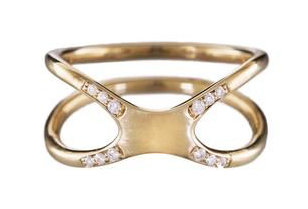 Jenny Kwon's Diamond Wrap Ring:14k gold with1mm diamonds that add elegance to a sculptural ring. Price, $920. The Japanese designers Rusty Thought are among my favourite contemporary jewellers. 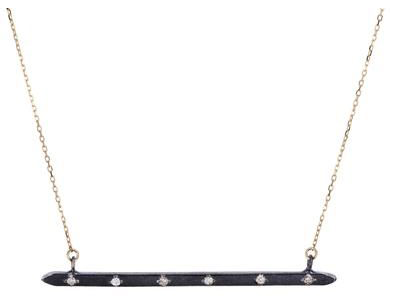 Example: their diamond bar necklace combines a gold chain with an oxidized silver bar set with six 1mm diamonds. Enough presence to wear alone, but also perfect layered; I'd not take it off. Price, $630. A friend has these Anne Sportun Flow Hoop earrings, which she bought to commemorate a decade birthday. (The drop is 13.5mm or just over a half-inch). 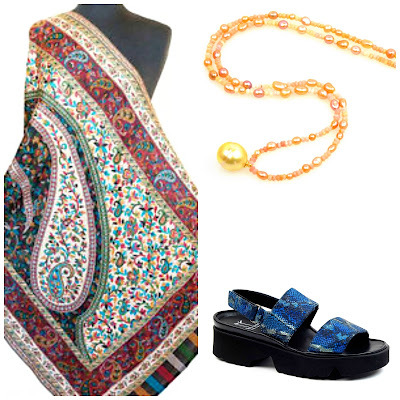 She wears them with everything; diamonds near the face, like pearls, lend a glow. 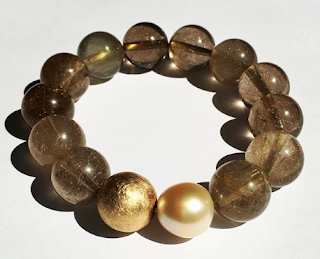 Anne Sportun uses beautiful stones; I have seen these in her showroom. Price, $CDN 1, 135. An evocative mix of 14k yellow and white gold, with tiny diamonds set on the centre vein; Gold Ruffle earrings by Shelly Gaffe. (Detail shown.) Price, $CDN 1, 450 at L.M. Pai Gallery. You need not obsess about the intricacies of diamond grading (and many pieces made with small stones will not provide it anyway); look at the gems in natural light and see if they flash. If you own a good diamond, use it as a comparator. I own jewellery with diamonds only 1.5mm and you can see them flash fire; I have other pieces in which diamonds several times the size are noticeably less brilliant. And then, if it lifts your heart, take such a piece into your everyday life. I know I'm biased, but in ten years, how will that bag hold up? What a timely post Duchesse. My mother gave me her 1950s diamond watch with over 30 small diamonds. The watch is not to wear as it is very dated (and doesn't work). My plan is to repurpose the small stones. I'm hoping for earrings and a pendant utilizing a number of the stones. Your post reminds me that I have this fun project ahead! Love the Anne Sportun hoops, they're so wearable. 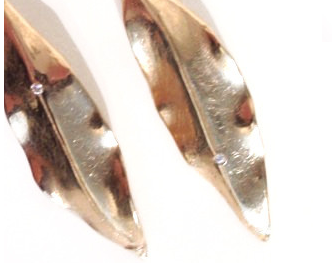 And the mix of golds on the Ruffle earrings is very interesting. I looked at the full photo...it would be like wearing autumn leaves, unusual and eye catching. Susan: Sigh. I have one of those watches too. My advice is to have the diamonds looked at by an experienced jeweller. Most diamonds in those watches, with the exception of very fine watches, are not very good quality. The cut is usually average at best, and they are often included. Diamonds below .18ct, known to the trade as "melee" are not expensive, but resetting 30 diamonds is quite a bit of labour, so you would want to be sure the diamonds are worth it. Often, when updating an old engagement ring, for example, a jeweller will use new melee of better quality, because the old ones are worn, but retain the center stone. Diamonds are hard, but not impervious to wear. If the stones are of superior quality, the jeweller's advice will be to use them. But far too many of those 1930's era "dress watches" were only of fair quality, and melee today is cut for far more brilliance. (It is likely your diamonds are cut with fewer facets, given the era of the watch, and therefore will not be as sparkly as a modern-cut diamond of this size.) Quality for melee diamonds varies widely- just like for larger stones. Even among new diamonds, cutting can make a 2mm diamond really lively and another one look like dried spit. LauraH: Have you ever visited Anne's Toronto boutique? Funny, the moment I saw those leaves I thought of you. I had a major birthday in April, and my husband gave me a silver pendant that is an open circle wrapped with a thin line of gold sprinkled with tiny diamonds. I love it! It "goes with" virtually everything I own and works with both silver and gold jewelry. And it is amazing how those tiny diamonds flash in the light. SewingLibrarian: Oooh, would love to see that! What a delightful way to mark a milestone. Sparkle on!